The Pentek RFC-BB cartridge is constructed with a 25-micron porous polyethylene outer shell and durable polypropylene end caps. The 4-1/2" OD cartridge incorporates a spun polypropylene core. Sandwiched between the outer shell and the core is a bed of granular activated carbon (GAC). 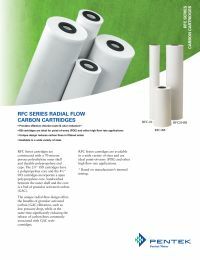 Ideal for point-of-entry (POE) and other high flow rate applications.